I wind up making a lot of bright pieces because I love playing with color, but I have a personal bias for earthy tones and neutrals (like over half of the things I own are brown. I love brown). 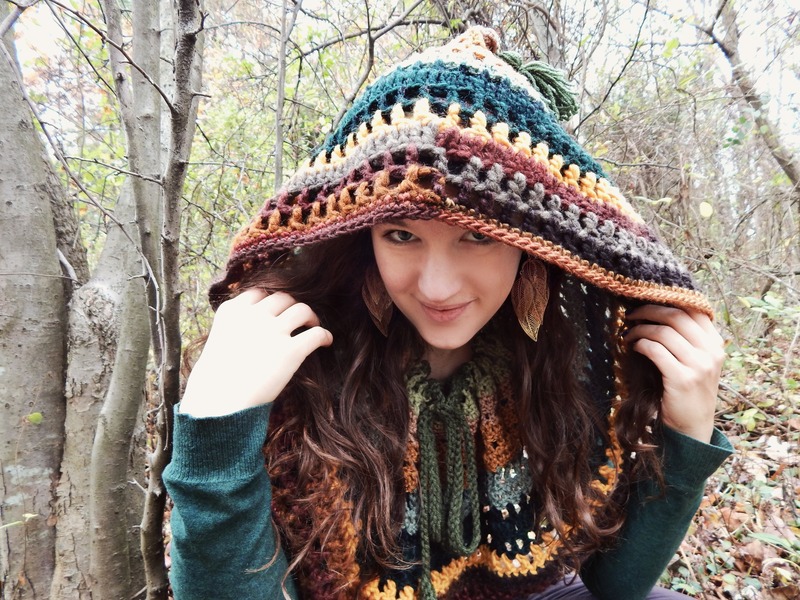 So when I was thinking about the color scheme for this Forest Fae Vest pattern I bought from the Etsy shop ForeverWanderingg, I decided to follow her example and go with pretty, soft, and earthy. I came up with an old lacy scarf that had gotten accidentally dyed in the wash and a big piece of crochet lace I had salvaged from a dress I found at Goodwill. Time to dye those puppies to match! 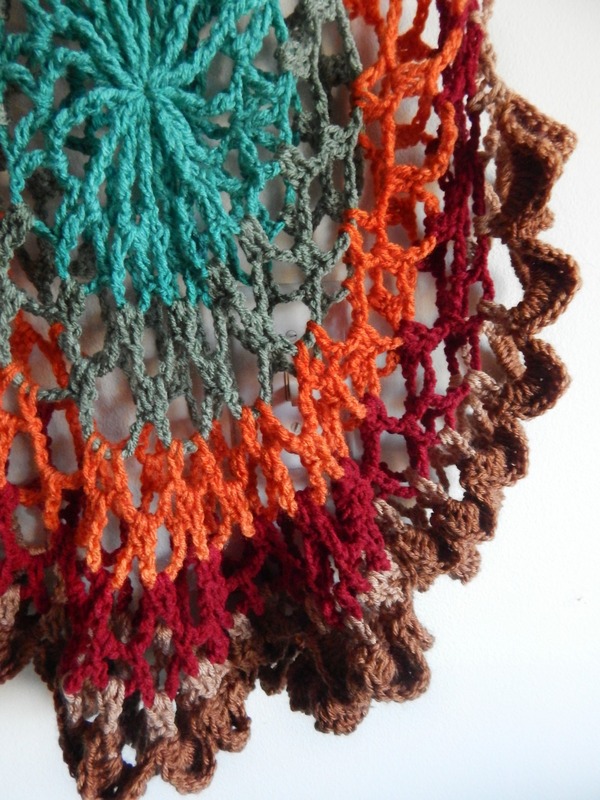 I used some Rit dye that I have had forever – can you believe I used dark brown and tan for this? Well, if you’ve dyed with Rit before you might, because it does tend to be a little bit of a crapshoot for color accuracy if you’re not careful. However, I prefer the lovely muted purple and am super glad that it didn’t come out dark brown. I even dyed that jersey cotton cowl to match! Sewing it on took some psyching up, because taking something you’ve lovingly crocheted by hand and sticking it in a machine to punch a bunch of tiny thread into it is SCARY. But it went smooth as butter and before I knew it this sweet fairy vest was ready to rock! Maybe you can tell I had a lot of fun making this? My favorite projects have always been based around upcycling – giving new life to old things, rediscovering their beauty. This project definitely fit that category. Thanks to a pro tip from a fellow Instagram spinner, I bought a jumbo bobbin and flyer kit for my Ashford Traveler wheel a few months ago and I have been loving it! Rather than get a whole new wheel for spinning bulky yarns, the jumbo bobbin kit allows me to spin all kinds of yarns on my regular wheel without taking up extra space. That doesn’t mean I have quit drooling over the Country Spinner or the Majacraft Aura, but it does mean I have been experimenting a lot with art yarns. 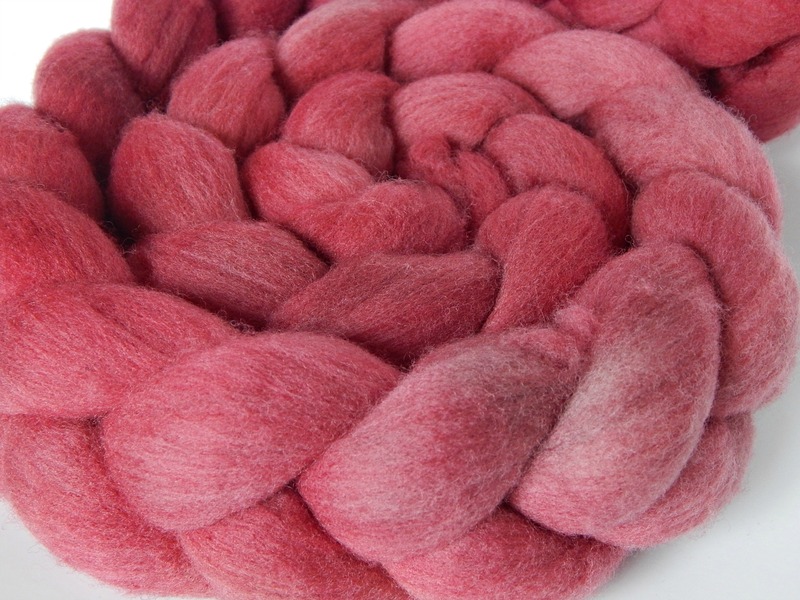 My most recent foray was with some BFL that I dyed and corespun in a gradient. 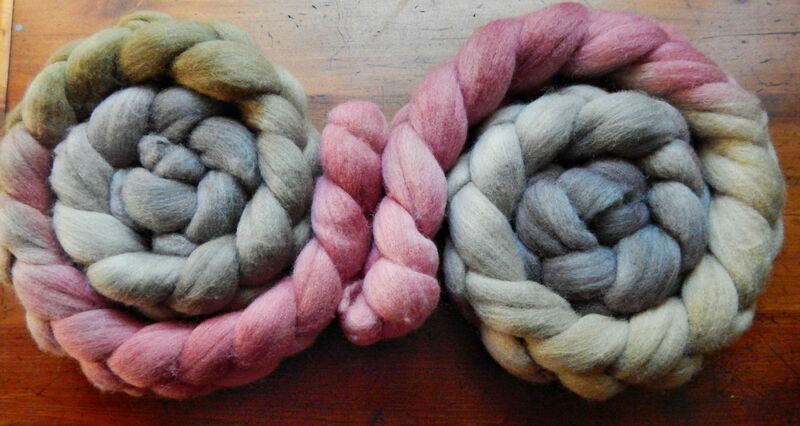 First, I had to split and fluff the roving (factory processing in addition to the dyeing process compacts the fibers – easily fixed by whipping the roving around a bit)..
Then I separated my colors so that I could spin them into a loooooong, bright gradient. Corespinning, or spinning fiber onto a core of pre-spun commercial yarn or thread, is one of my favorite techniques, because the resulting yarn has the smoothness and color-centric-ness (word? I don’t think so) of one-ply yarns, but you can still achieve soft, cushy yarns without worrying about your fibers pulling apart easily. This one is called “Fire in the Mountain” and is available in my Etsy shop, along with a bunch of other art yarns I’ve been hoarding! 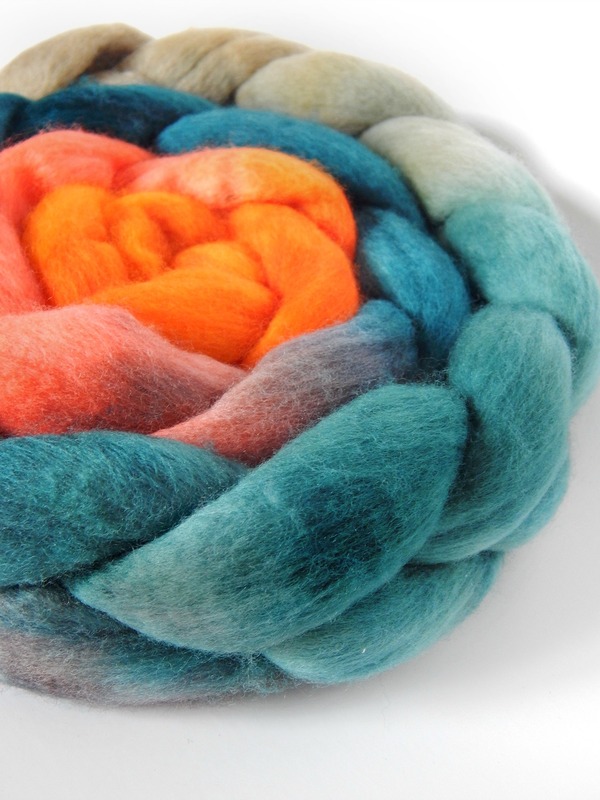 There’s been a color explosion over at my Etsy Shop recently as I listed some beautiful rovings that I dyed over Spring Break – along with some other new summer goodies! This was the largest dye session I’ve managed yet, and I’m happy to say that my process has come a long way since my first foray into fiber dyeing. Here’s a peek at the madness I unleashed on my poor kitchen! It all starts with coffee, of course. I dyed 4 braids of that earthy multicolored green and brown; it’s a generic wool blend from Dharma Trading Co. – no wool breed listed, but it spins up super nicely. The other three or so braids became faux dreadlocks using a combination of spinning and felting. The other 2/3rds of that braid is listed in my shop at a discount since it’s already split! As much as I am enjoying classes, I’m antsy and anxious as hell for the freedom to keep dyeing and spinning and stitching without other obligations. But I need to buckle down and finish the semester. Well, maybe just one more row. 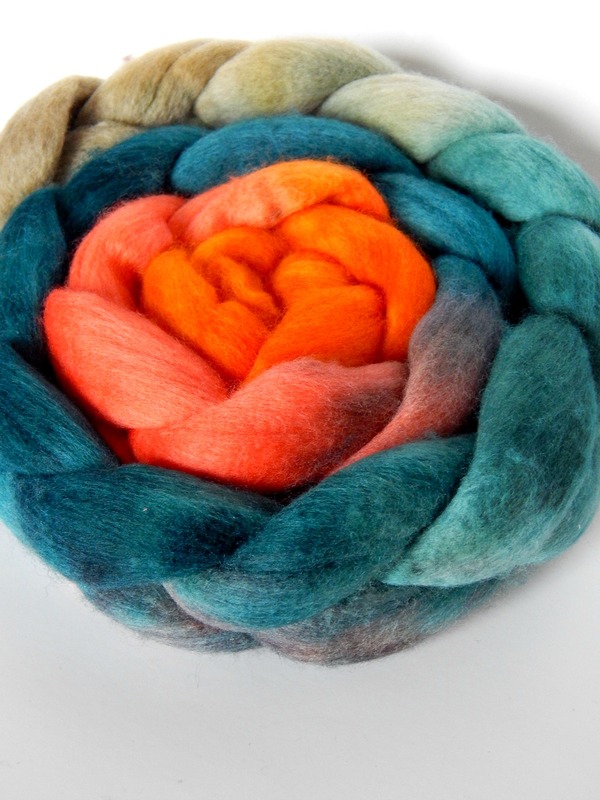 Mango Punch -Superfine Merino, 3.62 oz. I replaced the muted sage green of the first run of this colorway with a bright apple. I love both versions! Dyed Leather – on Gray Gotland, 3.62 oz. 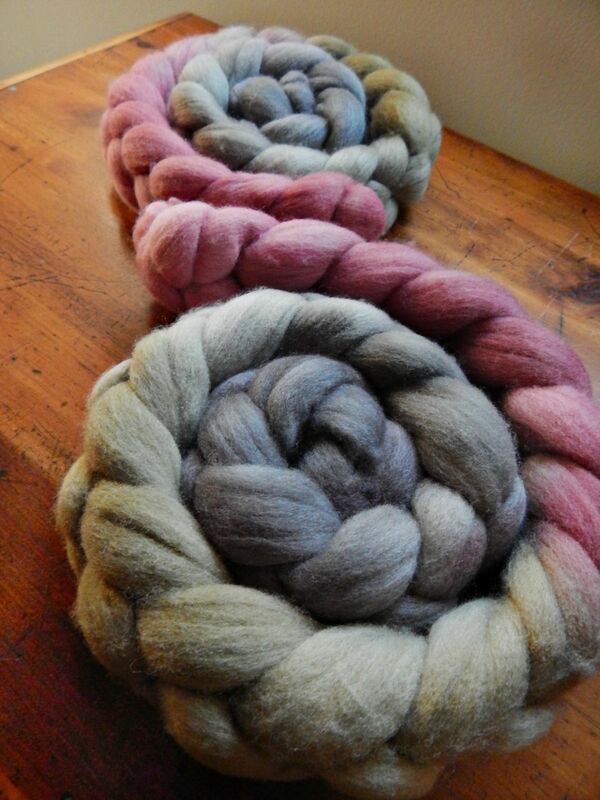 The natural silver tone of this fiber took the dyes exactly as I was hoping they would, creating complexity and depth. I also indulged in some doodling over Thanksgiving break, freehand with sharpies on a poster board. I do believe I will color it.. I guess you would call this a Zentangle, although I prefer less dense patterning in my mandalas. And finally, I am stoked on my very first homebrewed batch of kombucha! I love this stuff, and I have wanted to brew some for years. I finally obtained a Mother, and now I am seeing the formation of the daughter! Woohoo!!! 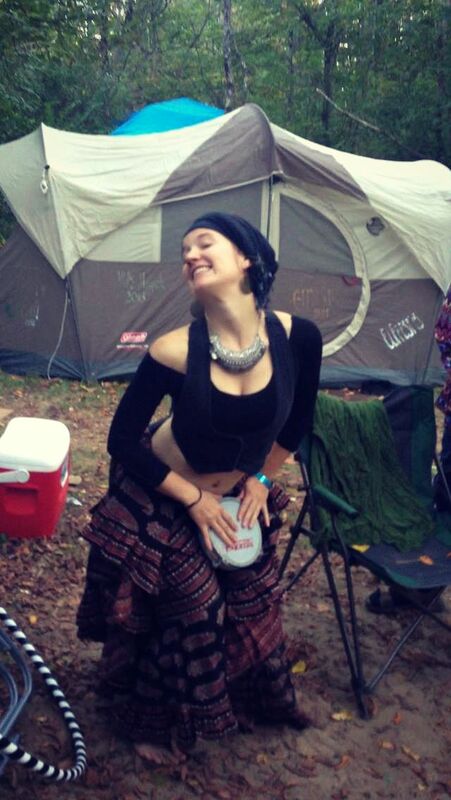 Slowly, ever so slowly, I inch closer to my goal of being a weird, hippie art teacher who brews magic potions in the woods and wears sweaters made from her own goats. Because it’s important to have goals. After waffling about whether or not I wanted to try this color scheme I’ve been toying with, I finally bit the bullet and used some superfine Merino to test dye (sometimes exhaustion lends you just enough crazy). I have to confess I adore it. It’s called “Mango Punch” and I’ll be tinkering with the colors and amounts more in the future, as I’d like to make it my first signature roving colorway. 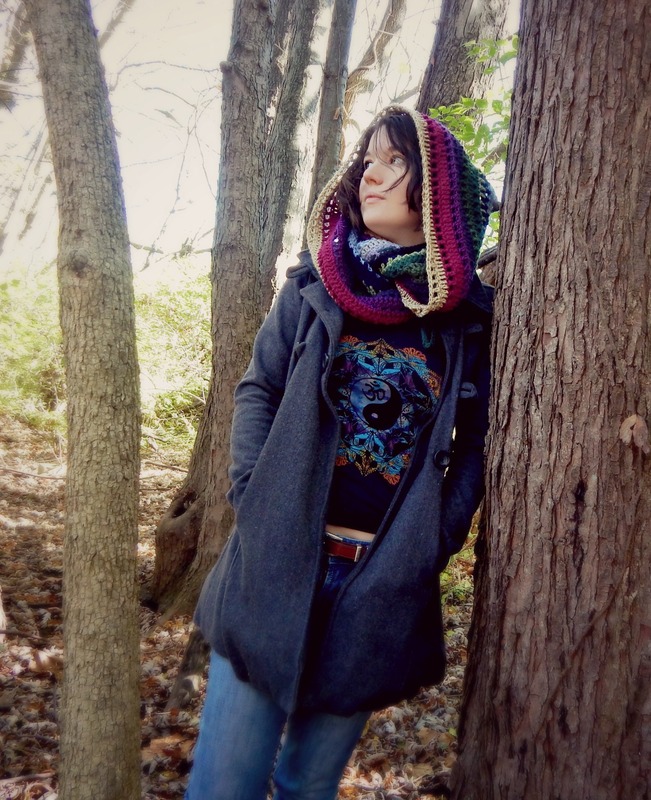 The cowls themselves are both available right now in my Etsy shop. If you’d like to get notified when the pattern becomes available, make sure you subscribe to my blog or follow me on Facebook! My Mandala Top pattern still yields me lots of color therapy – I just worked up with autumn-toned version in size small with some extra flounce added to the bottom. It reminds me of browned leaves falling to the ground. Can you tell I have a forest obsession? I have a forest obsession. For more Morale-boosting fiber-y goodness, check me out on Instagram. Even with school and rushing from one place to the next and releasing a new pattern, I had time to order and play with some of Dharma Trading Company’s limited-time release 2015 Fall Tones, which were DELIGHTFUL. I also added a new pair of floral mitts to my Etsy shop, a pair that I am particularly proud of. 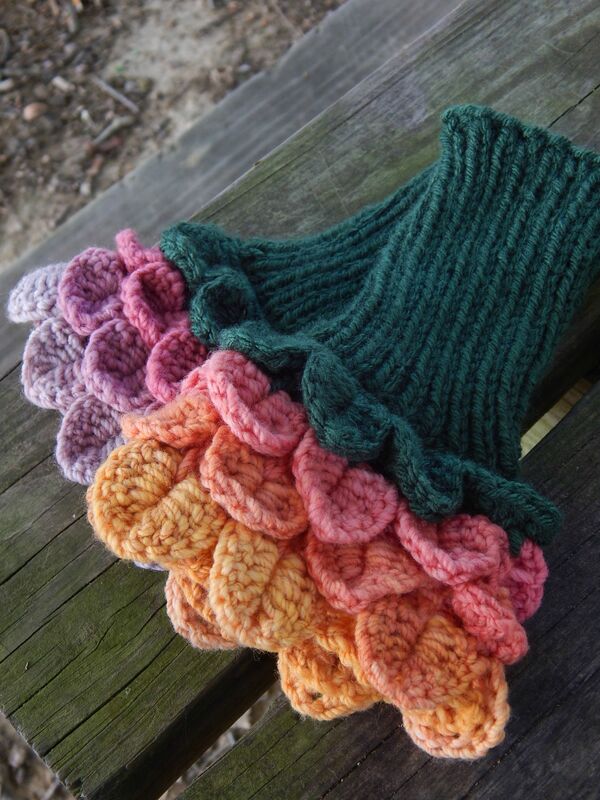 The first three rows of petals on each of these pretty half-gloves are hand-dyed by me and handspun with a Navajo-ply technique. They reminded me of big, beautiful garden roses. Those of you who follow me on Instagram and Facebook already know that I recently did some vending at my favorite local festival community, Lothlorien Nature Sanctuary. I always receive such love and support from my fellow community members there, and I couldn’t be more grateful! Plus the dancing and drumming ain’t bad. Plus, look at that VIEW. 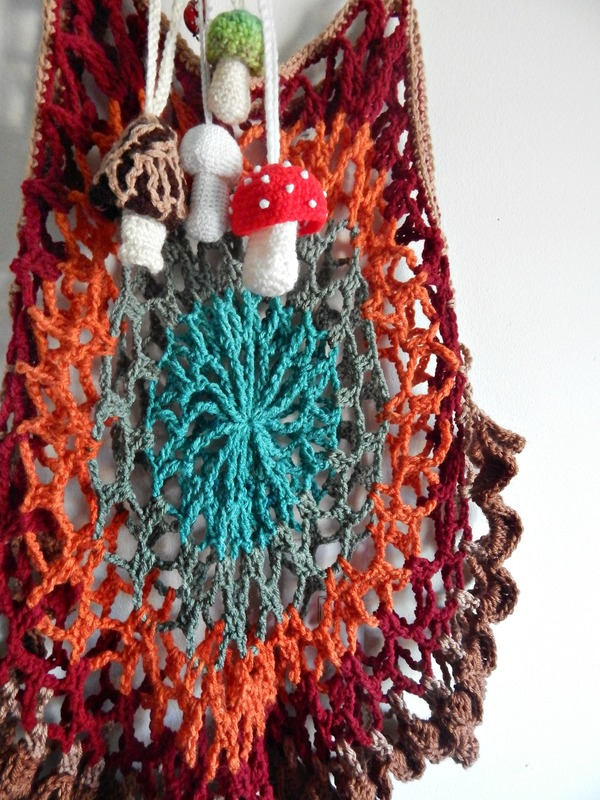 But now it’s back to reality – or semi-reality – as I crochet some mushrooms for my visual journal project and write about Greek amphora painting.